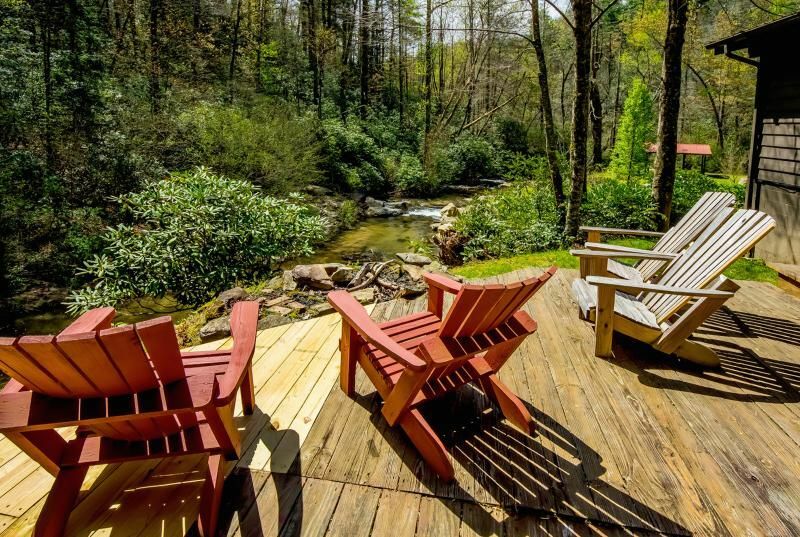 At the end of our private gated gravel road after a short drive through United States Forest land you will find nine of the most beautiful acres in western North Carolina. All four sides of our property are completely surrounded by forest. 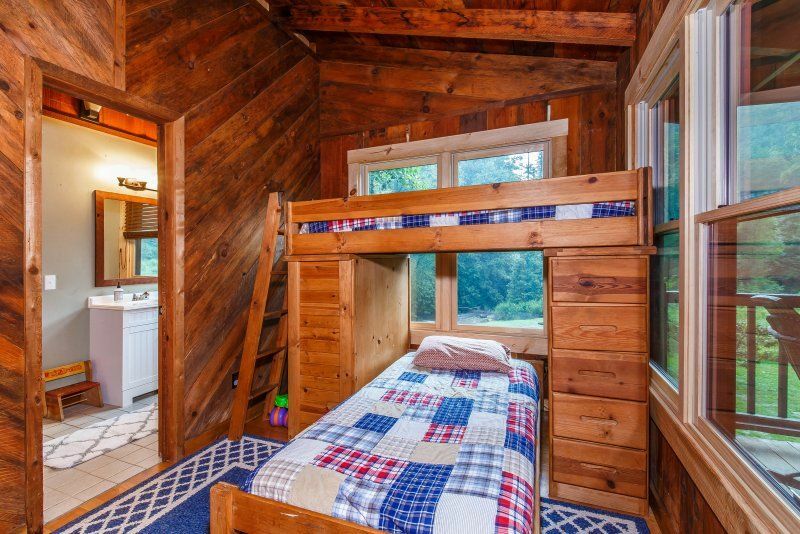 This cabin is for families, hikers, trout fly-fisherman, hunters, and people looking to trade the stress of civilization for nature, beauty, and fresh air. This rustic cabin was formally operated as 'Sweet Water Fly-Fishing Lodge' and has level access to the Thompson River, known for it's Brown Trout and wild Rainbow Trout fishing. 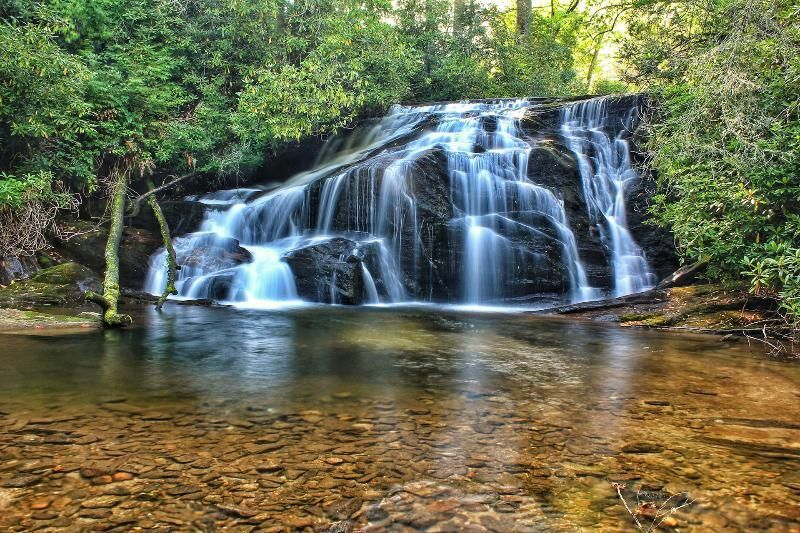 'White Owl Falls' is reachable from our two short private maintained hiking trails. The Thompson River flows directly beside the cabin. In other areas the Thompson River is mostly unaccessible by vehicle and typically only accessed by fisherman after a lengthy hike. 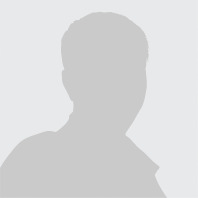 Our property is one of the few spots accessible by vehicle. 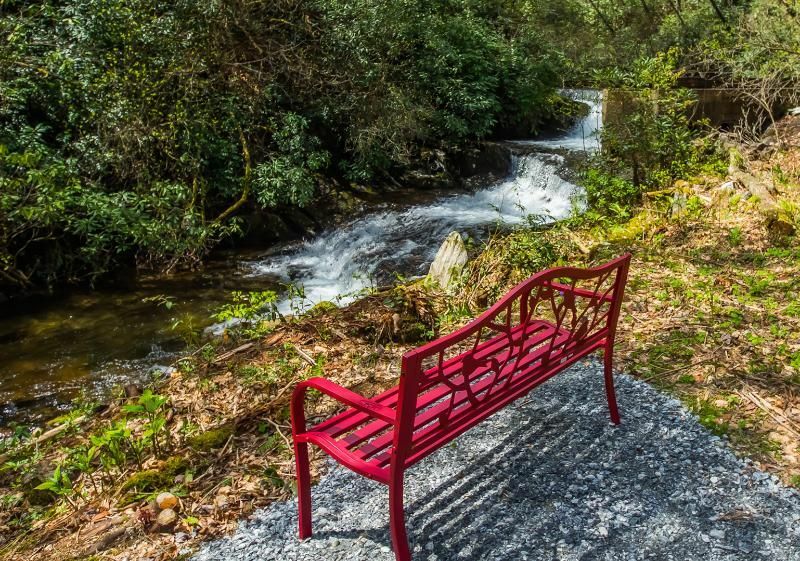 Both sides of this level trout river are private property for our renters’ exclusive use. 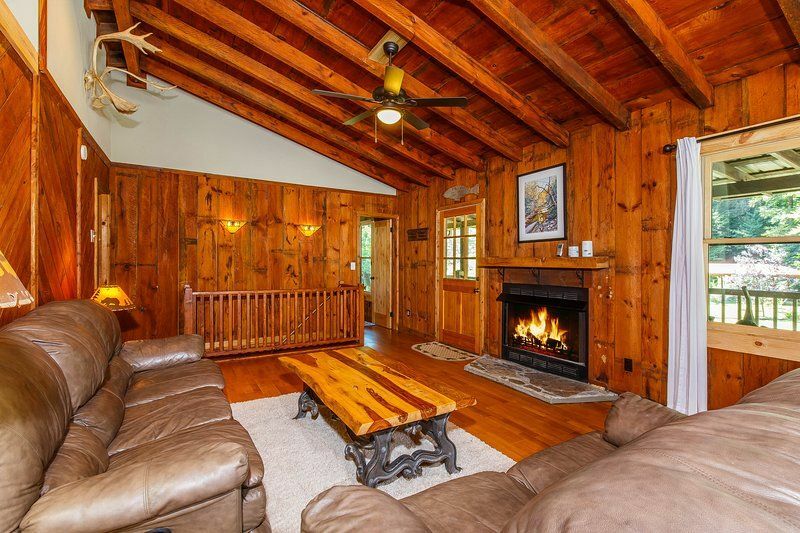 This property is a hundred percent secluded. There are no other cabins and the only thing to see is government forest land in every direction. Our property includes four 'trout holes' and rough trails into Federal Forest Land for fishing, hiking, swimming, and exploration. 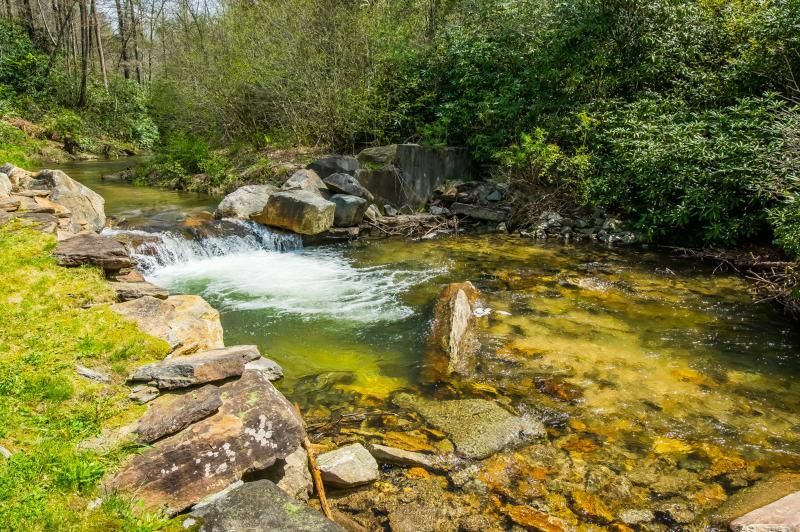 Adjoining the property, a ten-minute walk from the cabin's front door is “White Owl Falls”, a thirty-foot waterfall and swimmable lagoon accessible from our property's private hiking trail. Down river from our property is “Tall Falls”. There are also two swimmable pools, river level and flow permitting, in the Thompson River on our private property. One pool just off the large back porch of the cabin and another pool a short walk through the forest. 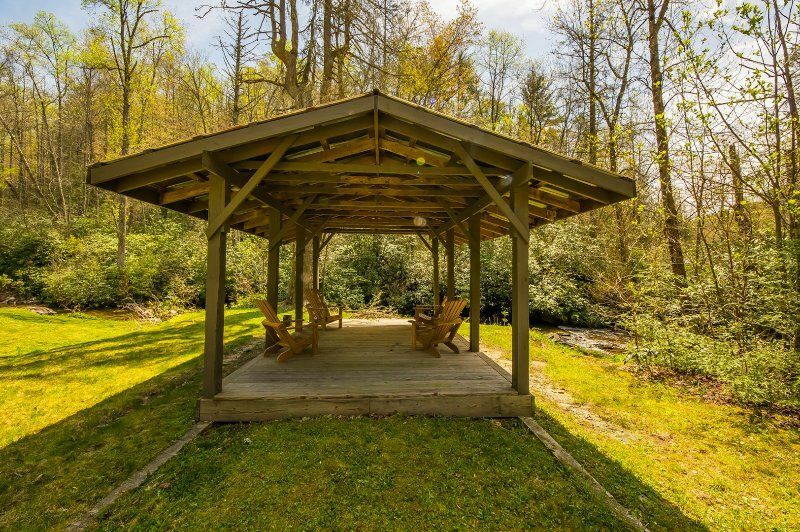 There is a large covered pavilion feet from the river, with a rock fire pit, picnic table and Adirondack chairs. 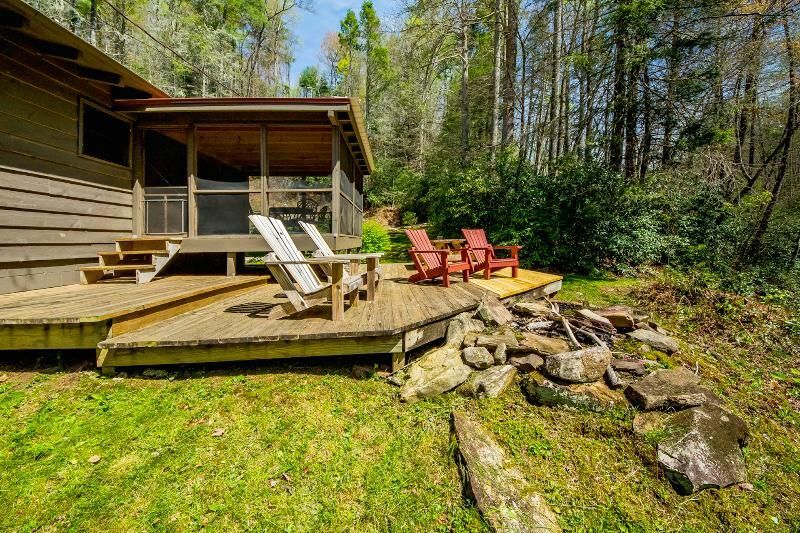 The cabin's outdoor spaces include a large covered front porch facing the meadow, a large deck in the back, and a screened in porch just off the kitchen over looking the Thompson River and the Nantahala National Forest. Inside our rustic cabin the main floor has two bedrooms: the master bedroom, which has a queen bed and one large walk in closets, and a bedroom with bunk beds. 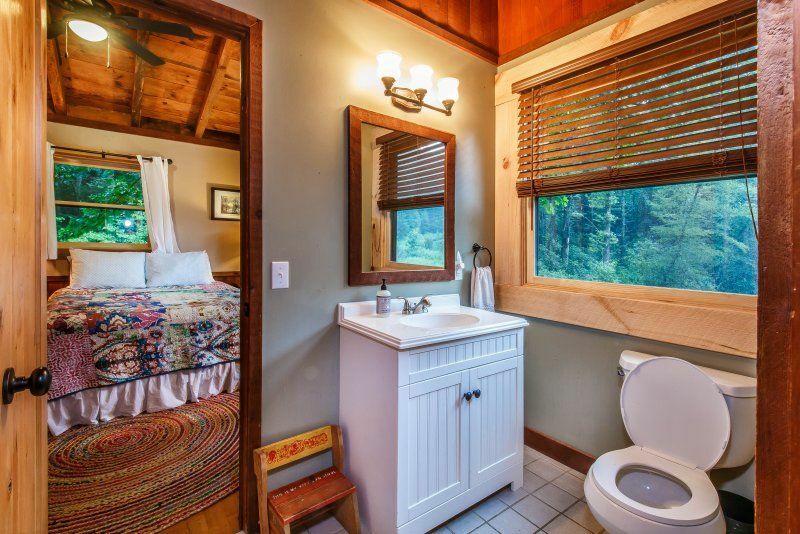 These two bedrooms share access to the cabin's main bathroom. 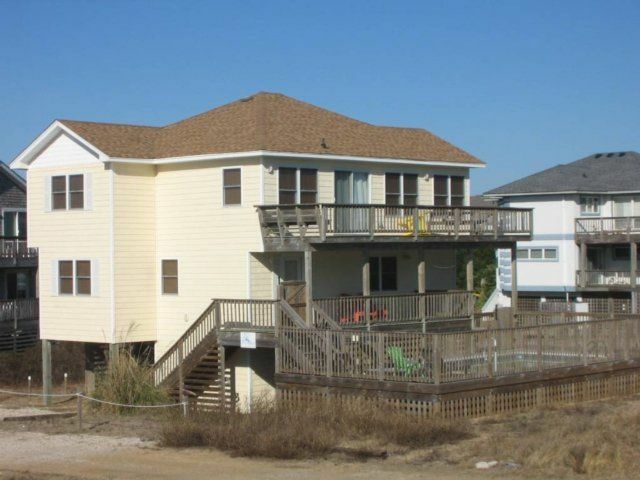 On the main floor there is also the kitchen, dining area, and living room, all open concept. The living room includes a simple gas fireplace. All bedrooms have baseboard heaters. Rarely is air conditioning needed, but if called for there is a newly installed top of the line mini split a/c and heat system in the main area of the cabin. 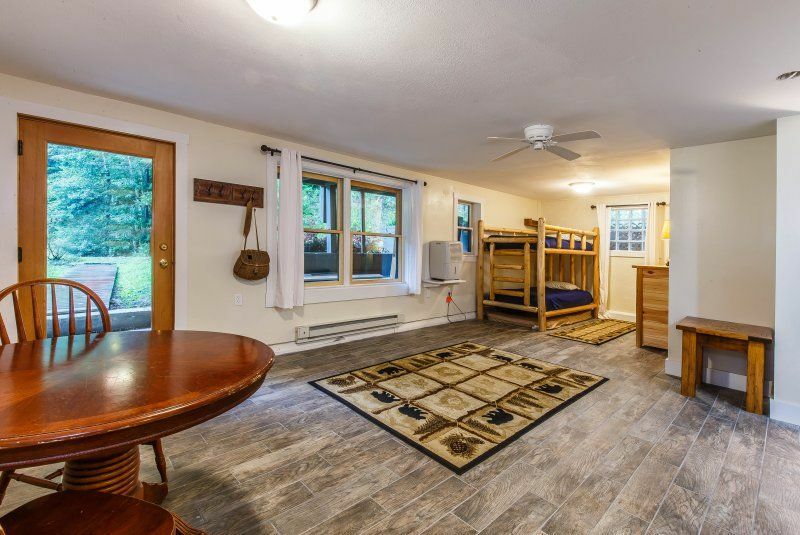 There is a downstairs with an additional two simple bedrooms, one with a full bed and one with a new queen bed and the house's washer and dryer. 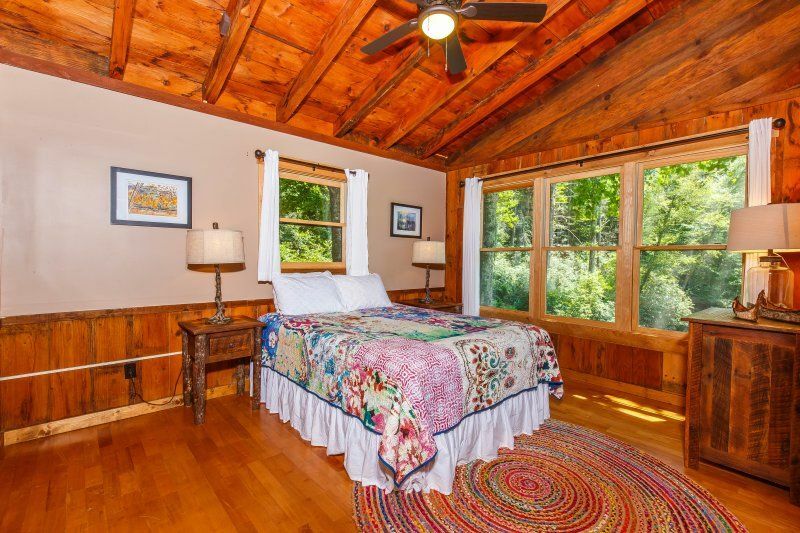 One of these bedrooms has direct access to the meadow. The second bathroom is downstairs and includes a full bath tub. There is an additional small third bath. 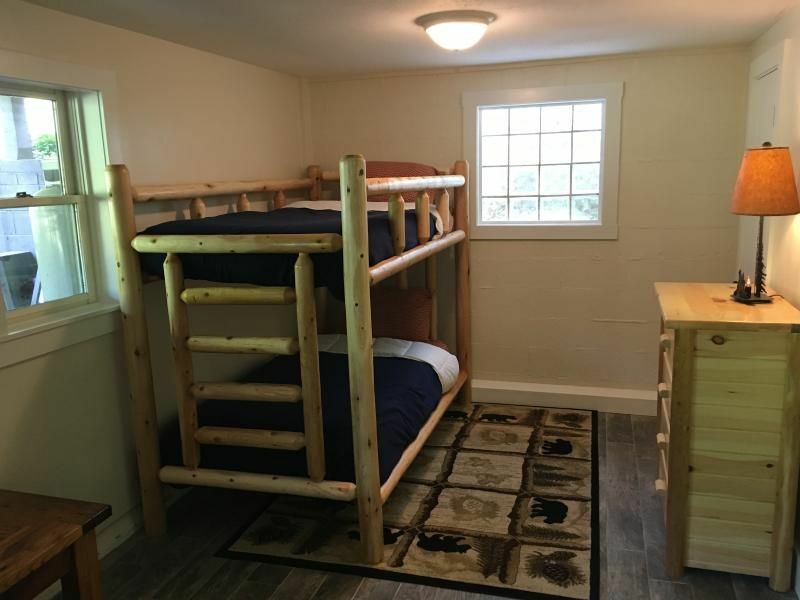 Also, there is a large living area with a second bunk bed area with direct access to the small bathroom. 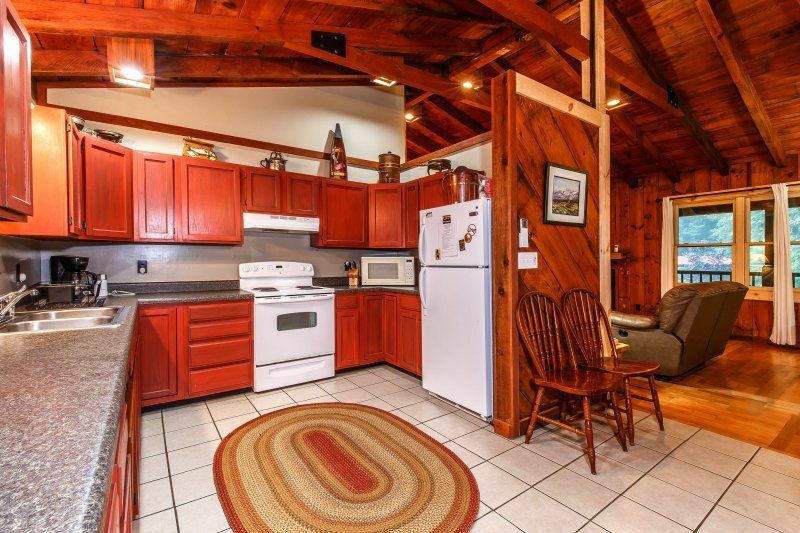 The cabin intentionally does not have cable or internet. There is a television, limited movie selection, and Blue Ray player that is on a movable stand for movie watching. 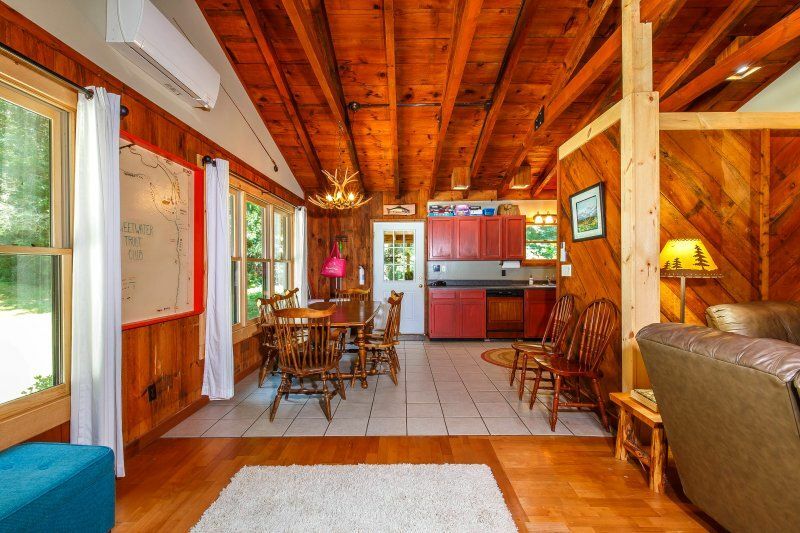 This is a cabin for a family, group of friends, couple, hikers, or fishermen who value the beauty of nature, the forest, water falls, and being on a river. 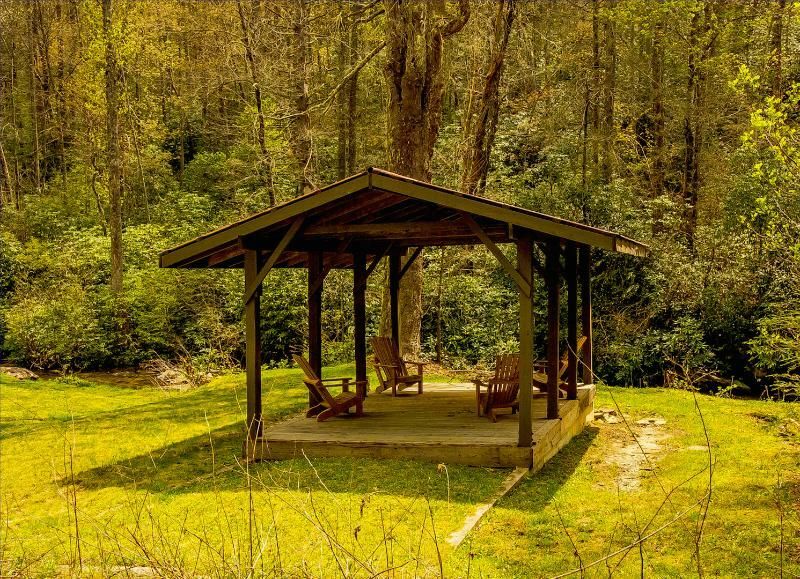 It is a simple cabin in the Nantahala National Forest where you are free to relax and will be at peace in the seclusion of the forest. 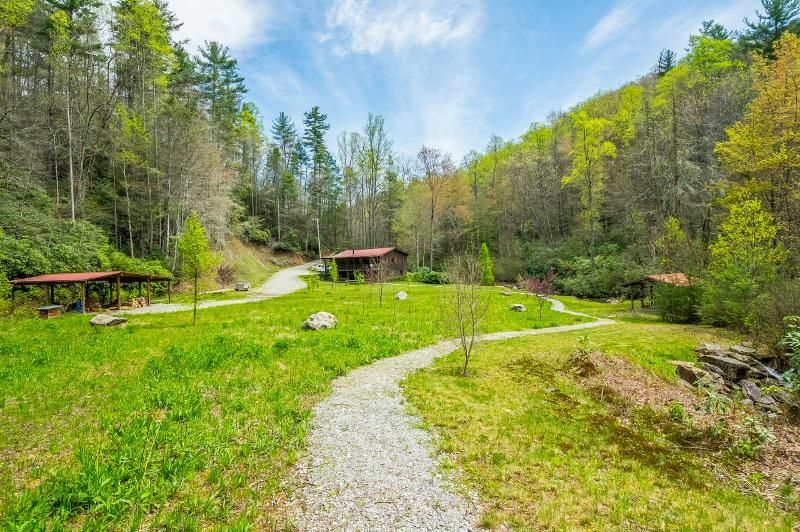 If you are looking for a uniquely beautiful property to get back to nature you have found it. 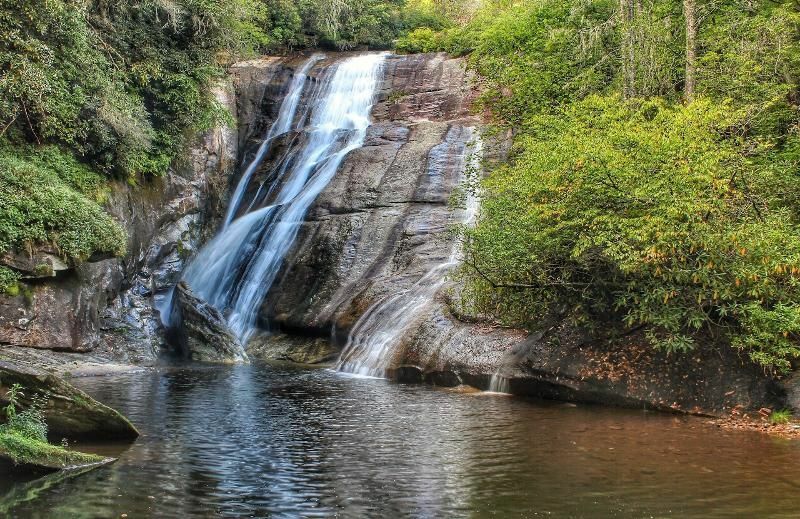 Located between Cashiers, North Carolina and Brevard, North Carolina in Sapphire, Transylvania County, North Carolina. The property is exactly as advertised. It was private, beautiful and relaxing. If you're looking to escape the monotony of work and urban life, this is the place. It is the perfect combination of roughing it and comfort. We hiked, fished (tried) and enjoyed explored this beautiful property. Its everything you need and nothing you don't. I look forward to visiting Andrew's property again. My wife and I were fortunate enough to secure this great secluded riverside mountain cabin for a family vacation with our two sons and their families. 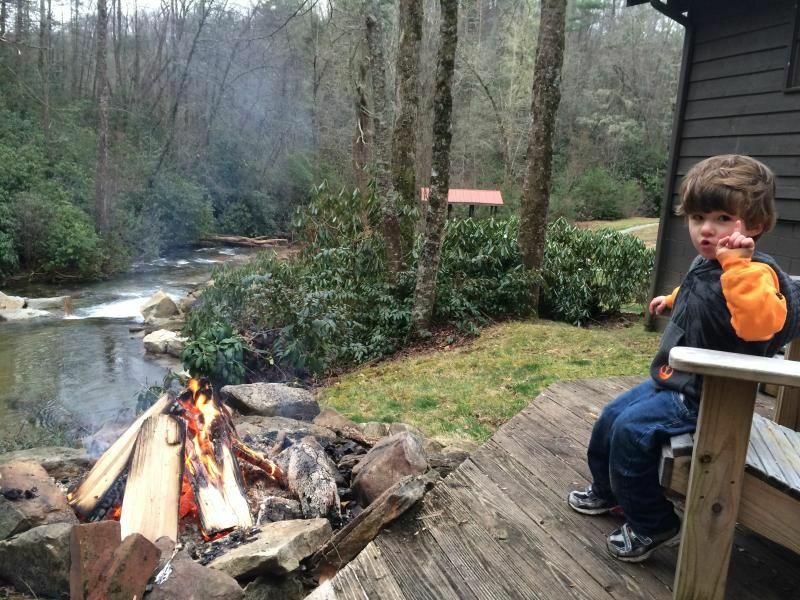 Needless the say, for adventurous grandchildren a "real mountain cabin" steps away from a "real mountain" river and within hiking distance to waterfalls is as good as it gets. 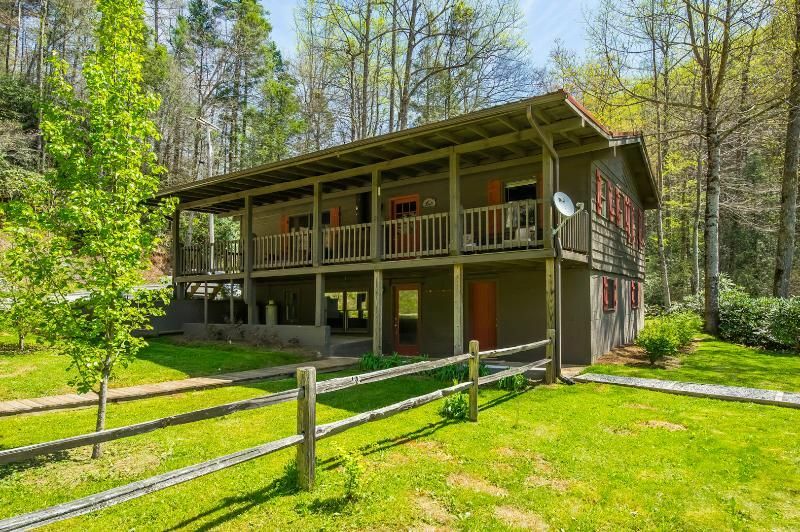 We found the cabin to be clean, generously equipped and well maintained Situated in the middle of 9 acres which in turn are surrounded by the Nantahala National Forest it is both secluded and serene. A wonderful place to relax, enjoy nature...and the family. Beautiful scenic and private location - it's even nicer than it looks online. Excellent hiking. The house is really nice. We enjoyed the herb and berry garden, meadow, deck and fire pits. Andrew is a gracious and attentive host. Andrew L Show Phone No.